Will you be pouring the tea soon? It's a very hot time of year. All of the dogs are, quite sensibly, taking a nap. All of them except Muha, that is! Muha is flying around on a bottle of barley tea, however he doesn't seem to realise that flying so low can be dangerous! Oh no, he crashed into Ryoku and woke him up! 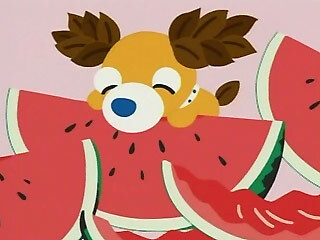 First of all, he has been eating lots of sweet watermelon, yummy! 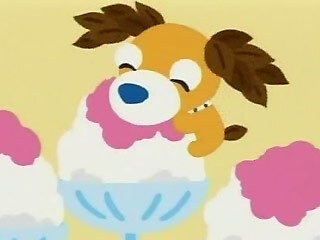 Seconly, he's been eating super-cold ice cream! 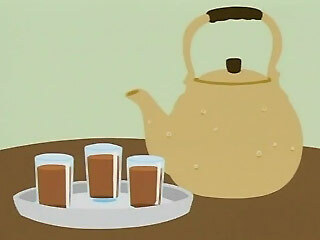 Last of all, Muha has been drinking lots of barley tea... ah, perfect for this hot weather. Whoopsie! Looks like Muha has eaten too much cold food and has an upset stomach. "Even if you like things and they're good for you, you should go easy on them."